This slice tastes awesome! Even if I say so myself. It’s my version of a Snickers Bar in a slice. 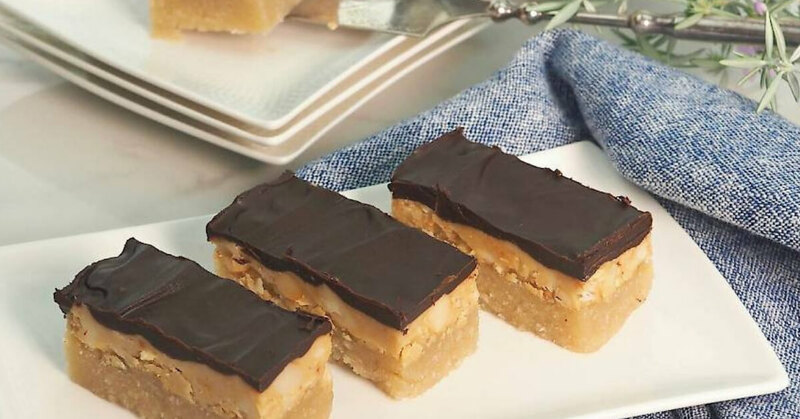 It has a firm salted caramel layer with roasted macadamias, between a soft textured base and a chocolate topping. My homemade version doesn’t contain peanuts, vegetable fat, soy, gluten or refined sugars, it’s actually good for you. Preheat oven to 160c (fan-forced). Line the base and sides of a 23 x 13cm loaf tin. To make the base: Add the almond meal, coconut, salt, coconut oil, coconut cream, honey and vanilla to a food processor. Process for 20 seconds to produce a fine and smooth mixture (it will be moist and a little oily but easy to spread). Transfer to the prepared tin and use your fingers to press and spread out the mixture evenly, then use a spatula or back of a spoon to smooth the surface. Place in the oven and bake for 10 minutes ONLY. The top will not be brown, it will still look uncooked. Set aside to cool in the tin. (The short cooking time helps the base hold together well, whilst still being able to keep its soft texture). To make the salted caramel layer: Add the macadamias and 1 teaspoon of ghee to a medium fry pan on low heat. Stir the nuts for a couple of minutes until slightly browning. Add the remaining ingredients to the nuts and continue stirring until the cashew butter melts, and all the ingredients have incorporated well into a smooth runny mixture. Pour the salted caramel mixture evenly over the cooled base and place in the fridge or freezer to set. To make the chocolate topping: Add the chocolate and coconut oil to a small saucepan over very low heat, whisk until combined and just melted. Remove from the heat and add the maple syrup and vanilla, whisk to combine. Pour the chocolate topping over the chilled slice and smooth over with a spatula, then return to the fridge or freezer to set. Once the chocolate is set, remove the slice from the tin and place on a chopping board. Allow it to sit at room temperature for 15 minutes to soften the chocolate topping before cutting, to prevent the chocolate cracking (I find it helps to score the chocolate first with a sharp knife, before cutting all the way through). Cut into 7 strips, then cut lengthways down the centre to make 14 fingers.